James MinchinThe almost-last minute free show from Welsh so-much-power-trio The Joy Formidable show at The Mod Club next Monday night, November 26, announced earlier this week was unequivocally good news, but there were some questions on just how one would go about getting tickets seeing as how it was being sponsored by Virgin Mobile and CFNY 102.1 The Edge. Would you have to change cellphone providers? Subject yourself to the Dean Blundell show? Maybe, but also no. You could just keep doing what you’re doing right now – reading this site. Thanks to the good folks at Union Events, who’re actually putting the show on, I’ve got a handful of passes to give away. I’ve given away a couple pairs via Twitter already – if I didn’t @ you this morning, you didn’t win so keep reading – but now also have five pairs to give away here. To throw your proverbial hat in the ring, email me at contests@chromewaves.net with “I want a Joy Formidable” in the subject line and your full name in the body, and have that in to me by, say, 6:00PM on Sunday night. Their new record Wolf’s Law is out January 22. Whilst on the topic of joyful bands, a rather stellar-sounding Joy Division bootleg circa February 1980 at the University Of London has surfaced and is available to download in FLAC form at The Power Of Independent Trucking. Frightened Rabbit have released a video from their forthcoming album Pedestrian Verse, due out February 5. Filter and Lees Music Scene have interviews with Dry The River. Interview and Nylon talk to Kate Nash about her new Death Proof EP and forthcoming Girl Talk album, due out in March. Blur have made another live clip from this Summer’s Hyde Park show available to watch. The live set Parklive is out December 3. Electro-soul man Jamie Lidell will release his new self-titled album on February 18 and will be in town at Lee’s Palace on April 8 in support. Tickets for that are $15 in advance. PopMatters talks to Pete Wiggs and Under The Radar to Sarah Cracknell, both of Saint Etienne. Frank YangThe demise – for this year, at least – of Toronto’s Virgin Festival had one positive side effect, in that the corporate title sponsor found themselves with some budget to spend on a music event and nowhere to throw it… and so they threw it at NXNE. This not only gave the festival the means to land a bona fide, big time headliner to build things around, but they were able to present said act for free on a big stage in the heart of the city. No question, Iggy & The Stooges was going to be an event. But not the only event. The Yonge-Dundas mainstage had a full slate of acts leading up to the big show, including a number of acts who were significant draws unto themselves. My evening started with Florida’s Surfer Blood, who came into the fest as one of the bigger buzz bands and with a number of showcases on the schedule in addition to this one. And it’s a good thing they did, because if this were their only chance to impress, it’d have been a mighty flop. Presumably through no fault of their own, the young quintet’s equipment began self-destructing just a few songs into their set, causing extended delays on stage, clearly frustrating the band, boring the audience and killing any momentum they’d have hoped to build. They finally did manage to get it together to close their set out strongly, but this performance would almost certainly have to go in the better-forgotten pile. And even without the technical difficulties, I wasn’t especially impressed with what I heard. Decent guitar pop, but not really anything worth getting so excited over. Go figure. Clash and Spinner have features on the band. Though San Diego’s Wavves made headlines a year ago for an on-stage meltdown by frontman Nathan Williams, he was the model of composure this time out. Previewing material from his forthcoming sophomore album King Of The Beach, out August 3, Williams was chatty and good humoured on stage, if a bit odd and manifesting a Paulie Shore fixation. But no meltdowns and without the benefit of a home studio with which to layer on the lo-fi fuzz onto their songs, the sounded much more melodic and comprehensible than on records. Still fast and loud, but tuneful. A pleasant surprise. Yours Truly and PitchforkTV have video sessions with Wavves. An outdoor stage in the daylight isn’t the first place you’d expect to find Denmark’s Raveonettes, but as much as you’d think their bubble-gaze aesthetic best suited for dark clubs, it proved to work surprisingly well out in the open air. Assisted by copious amounts of reverb, Sune Rose Wagner and Sharin Foo – accompanied by a full rhythm section – filled the square with the loud yet airy sounds of their latest album In And Out Of Control. As ever, they weren’t the most animated performers on stage, but their distinct look and sound – and hooks aplenty – would be enough to keep all eyes on them. They’re currently preparing a b-sides compilation and will have a new album ready in the new year. As the evening progressed, it was interesting to see the composition of the audience change. Earlier on, it was the kids more interested in the hot new acts than the veterans and keener fans, diligently arriving early to score a spot up front to get the best view of the rock legends. But as the hour of the show drew closer, a more… shall we say “punk correct” element began to make up a larger percentage of the audience and by show time, the Square and adjoining streets – they wisely closed off Yonge St between Queen and Dundas for the event – were jammed and teeming with representatives from every imaginable cross-section of society, including the crustier ones. None of which was of immediate concern to me, as I had arguably the best seat in the house for at least the first couple songs of the set, right up front in the photo pit. And there was no doubt as to when the show began, as James Newell Osterberg, Jr – Iggy Pop to his friends – bounded out on stage and clad only in a pair of jeans and in both great and grotesque shape for his 63 years, wasted no time in letting everyone know that The Stooges’ advance billing as one of the greatest rock bands ever was far from just hyperbole. And seriously, he was amazing to watch as he danced, posed, raced around the stage and climbed into the audience while singing the never more appropriate “Raw Power”, delivered with righteous fury by a Stooges lineup composed of Scott Asheton on drums, James Williamson on guitar, Steve Mackay on saxophone and Mike Watt on bass – not period correct, but seriously heavyweight nonetheless. It was truly something to behold, if for only six or seven minutes until we had to vacate the pit. At that point, it became less a concert than a soundtrack for fascinating people watching since there was no way to see the stage for the sea of humanity spilling over the edges of the Square. I heard there was a stage invasion during “Search & Destroy” but couldn’t tell you for sure. What I can tell you is that I saw the people who had waited at the front all day getting pulled out and over the barricade by security because there was no other way out, I saw people drunk and stoned out of their minds freaking out, either from Iggy or whatever they were on, I’m not sure, I saw a kid punch a cop (that didn’t end well), all to the sound of The Stooges sounding pulverizing and vital. The vibe was suitably dark and on the edge of violent, with Iggy right on the edge of inciting more chaos, but as far as I know no one was hurt, and so it can go down in the books as a pretty remarkable milestone in NXNE and Toronto concert history. I do challenge the assertion that it was the biggest free concert in the city ever – the free R.E.M. show in 2001 was pretty freaking massive and stretched all the way down Yonge St… but I digress. Iggy. Stooges. Epic. Spinner also has a review of their show. Clearly, this would have been a logical time to call it a night – there was no way to be topping Iggy – but fact is it wasn’t even 11PM and there was still plenty to see, so after a breather at home, it was back out to see Avi Buffalo at Lee’s Palace. The California quartet led by Avigdor Zahner-Isenberg just released their self-titled debut, and it featured the right balance of unusual and accessible, thanks largely to Zahner-Isenberg’s warbly indie-pop vocals and songwriting and searing jazzy-prog guitar chops, reminiscent of Nels Cline. Their live show wasn’t far off from their recorded work, with Zahner-Isenberg indulging in more than a little guitar face during instrumental excursions, and punctuated with some odd banter, though that may have just been a consequence of the band being excited to be somewhere they were of legal to drink. The last stop of the night was the El Mocambo, where London’s The Gin Riots would fulfill my British rock quota for the festival. I’d likened their sound to that of The Libertines and Arctic Monkeys, but watching them perform I was reminded more of The Rumble Strips, albeit more country inflected and less idiosyncratic. They were entertaining and engaging performers with a brace of energetic and songs, but I couldn’t shake the feeling that everything they do has been done before and done better. But considering how solid and fully realized they are without even having released an album yet, there’s still plenty of time for them to find their own niche. Black Cab Sessions takes Band Of Horses for a ride while Spinner staged a surprise show for the band in New York’s Grand Central Station and turned it into an Interface session. aux.tv talks to Pavement drummer Bob Nostanovich. The Globe & Mail and Chart interview Broken Social Scene while MTV finds out about their contributions to the Scott Pilgrim movie soundtrack. U2’s ($150,000,000) loss is Interpol fans’ gain – with the cancellation of the U2 Summer tour and Interpol’s opening slots on it, they’ve assembled their own Summer tour which includes a date at the Kool Haus on August 10. Tickets are $30 and go on sale Thursday – it’s been a while since they’ve been here, but that’s surely an undersized venue for the band so expect it to sell out fast. Their fourth, self-titled album is out September 7 and the new video is available to watch over at Stereogum. Here just a couple weeks ago, Jamie Lidell will be back on September 14 for a show at the Opera House. The Walkmen will release their new record Lisbon on September 14 and be at the Opera House on October 9 to support. Frank YangThe Saturday night of Canadian Musicfest featured a considerable shift in musical gears, starting out with the gentle, harp-led orchestrations of Joanna Newsom at the Phoenix – not a CMF show and which will be written up tomorrow – and ending with some big, loud guitar rock at Rancho Relaxo. Who says I don’t have varied tastes? An expedient streetcar and longer-than-expected set meant that I was able to catch a couple songs from Montreal’s Kill The Lights. It almost seems wrong to say I’d seen them before, as June 2006 seems like a lifetime ago and the band has undergone changes in the interim, most notably losing co-lead singer Steph Hanna sometime in the past few years (I haven’t been keeping up). That said, Kill The Lights circa 2010 didn’t sound too different from what I remembered; their collective music collection clearly overlapped with mine in and around the drone-rock/shoegazer end of things, but they took their influences in a decidedly more extroverted if somewhat anonymous direction. Spending some time with last year’s Fog Area revealed more nuance than was particularly detectable live – they like it loud – and some more personality. The best moments sound like Black Rebel Motorcycle Club with a more electronic sheen and a bit more jump in their step; the rest is just kind of forgettable. I’d seen Providence, Rhode Island’s The Brother Kite in Austin, New York City and Montreal but never Toronto, even though I was the one who put together the show for their last visit here back in Fall of 2007 (I was still at Pop Montreal when they played Tiger Bar). It’s not that I was following them around, necessarily, it’s simply that our paths crossed at various festivals and why wouldn’t I take the opportunity to see the band who put out one of my favourite records of the past decade in 2006’s Waiting For The Time To Be Right any chance I got? But that they were here again and playing just down the street from home was extra sweet. No airfare required! Not surprisingly, their set drew a fair bit from their new record Isolation, wholly in the can but still in search a loving home to release it into the world. Though the new material takes a leaner, more spacious approach than the Ride-meets-Beach Boys lushness that made Time such a joy, it’s still immediate and wonderful – what does it say about a band that they can step away from a winning formula and still impress almost as much? It was great to hear new material from them and the contrast it provided to the older material, with its soaring guitars and melodies, made the familiar songs sound even more majestic. It remains a crime that a band this good remains so unknown and underappreciated, but I did take some satisfaction as looking at some of the impressed faces around the room and knowing that they were at least now that much better-known and appreciated. A few tracks from Isolation (as well as their other two albums) are available to stream at their website. Spinner, Owl & Bear and SxSW profile Slow Club, one of my must-see acts for SxSW this week. They’re playing Eastbound & Found on Thursday at 3:15PM (and other days/places but let them plug their own shows). The Guardian profiles Laura Marling, whose new album I Speak Because I Can is streaming in its entirety over at The Times, a week before its March 23 UK release and three weeks before it comes out in North America on April 6. The Futureheads’ new album The Chaos will be getting a North American release on June 1. Nota bene: Florence & The Machine’s April 10 show at the Phoenix has been moved to the Kool Haus. Original tickets still valid for the new venue and 1000 or so more tickets are now available. Rock rules at the Mod Club on April 28 as Band Of Skulls and The Whigs roll into town. The Whigs released their new record In The Dark today; stream it over at Spinner, who also have an interview with Band Of Skulls. The Guardian, AV Club, SxSW and NPR have interviews with Frightened Rabbit, who have a date at the Opera House on May 4. And what, you may ask, could possibly prompt me to miss Frightened Rabbit’s second Toronto show in a row? Well, the fact that Welsh trio The Joy Formidable, one of my top new discoveries of the past year or so, will be playing at the Horseshoe that same evening – May 4 – as part of Nu Music Nites (read: free). Now I love me some Frightened Rabbit, but I’ll be seeing them this week at SxSW and they will be back. 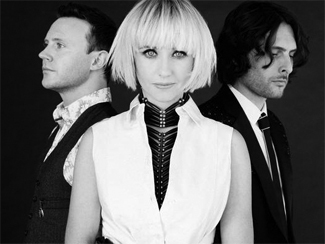 I would like to believe that the world will discover how excellent The Joy Formidable are and they, too, will be touring the world regularly but… just in case, I’m going to this show. And if you’re not at Frabbits, you should too. The Alternate Side has an interview and video session with the band. Their debut mini-album A Balloon Called Moaning is due for a North American release in March or April and their as-yet untitled first full-length is due out in June. Jamie Lidell has set a date for the Mod Club on June 12, tickets $20. His new record Compass is due out May 18 and Paste has a chat. BBC talks to The Charlatans’ Tim Burgess about their decision to mark the 20th anniversary of their debut Some Friendly with a reissue and tour. The Music Magazine has an interview with Jake Evans, the one member of Bad Lieutenant who was never in New Order.